Controversial plans to expand a renewable energy plant at a Plaistow farm will be decided today (Tuesday March 3). 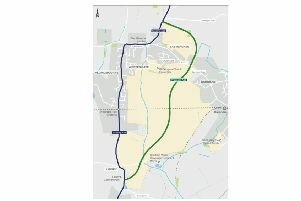 West Sussex County Council planning committee is meeting in Horsham this morning to determine a retrospective planning application for Crouchland Farm to upgrade an existing anaerobic digestion (AD) facility and install a new digestion tank, two new combined heat and power (CHP) engines, a digestate lagoon and associated infrastructure. The equipment converts farm waste, including maize and manure, into gas which is then used to produce electricity. Planning officers have recommended the plan be approved and residents are expected to turnout to the meeting in force to express their objections. Villagers of Plaistow, Ifold and Kirdford have fought a long, hard battle to stall the plans, even taking legal advice from a top London QC. The decision was put back a month after an 11th hour legal submission via Plaistow and Ifold Parish Council. Residents are most concerned about the HGV traffic on the country roads, the noise from traffic and the plant and the industrialisation of the countryside. Leon Mekitarian, managing director of Crouchland Biogas says approval of the plans today would sustain the dairy herd at the farm. He maintains vehicle movements would be tightly controlled under a permitted planing scheme and the farm would benefit the community.